SAS historians (not all SAS users!) know Anthony James Barr (aka Tony Barr or Jim Barr) was the designer and implementor of SAS language (1966-1979) and the first Chairman and President of SAS Institute (1976-1979). 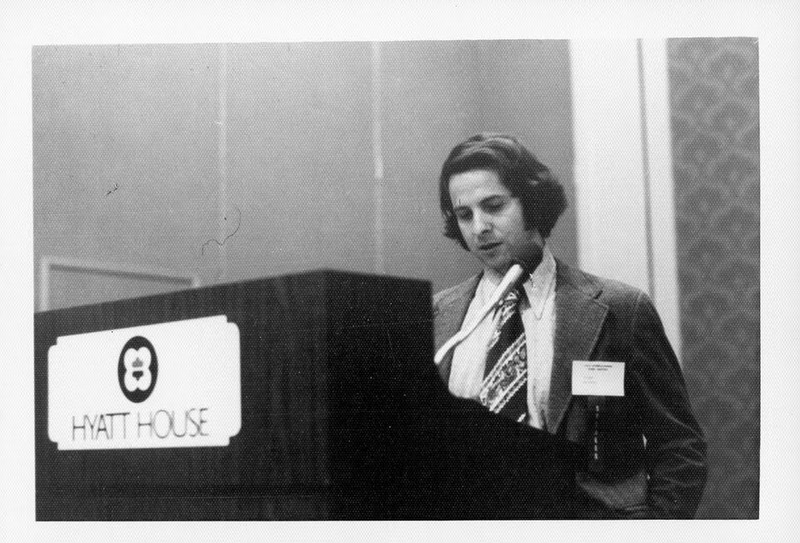 In this picture was Tony Barr in the first SUGI (January 26-28, 1976, Kissimmee, FL), taken by the first SUGI chair Julian Horwich. It’s said in 1970s, everyone had long hair! I was particularly interested in the early history of SAS when traced back the SAS file system to FFS (Formatted File System) in Tony Barr’s statement, SAS Related History. It’s not relational in the sense of RDBMS, but definitely a database management system(DBMS). Then you may understand why some people still call SAS library/datasets “database”. They are right in this non-relational point of view. Actually there are lots of parallel efforts to develop non-relational databases even after 1970 (when Codd introduced the concept of relational model). Google’s BigTable for example is not relational. 1960s-1970s was the emerging period for statistical computing technology (also golden age of technology). SAS as software was conceived in 1966, implemented in 1968 and got first massive distributed release in 1972 and then as a company incorporated in 1976 (you may know Apple also founded in this year; Microsoft 1975; Oracle, 1977; SPSS also in the same period). Around this time, PL/1 first appeared in 1964 (SAS was initially written by PL/1), C developed during 1969-1973 (SAS rewritten by C in 1980s), SQL 1978, S language 1976. Hidden Value by Charles A. III O’Reilly, had one chapter for SAS where we can learn bits of its early history. Object Lessons by Tom Love: few pages for SAS that we can know the initial price of SAS software was $35. Will keep updating and thank you for any inputs.